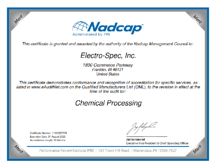 As a National Aerospace and Defense Contractors Accredidation Program (NADCAP) Certified Manufacturer, Electro-Spec is dedicated to meeting the highest quality requirements for chemical processing. We pride ourselves on our commitment to upholding this set of specifications in order to improve supplier quality and reduce cost through improved standardization. We want to share our NADCAP certificate with anyone who wishes to download and save it for their records. To access our certificate, simply fill out the form on the right.